Breast cancer (BC) is the most common cancer affecting women in the United States and metastatic breast cancer is the leading cause of death. The role estradiol plays in ER-positive BC is well-documented, but the way it contributes to ER-negative BC remains unclear. In the present study, we utilized an experimental model of BC metastasis into lung by injecting ER-negative murine 4T1 cells into mice via the lateral tail vein. A 56 % metastasis occurrence rate following the injection of 5 × 103 cells was observed, thus this cell number was selected to study the potential stimulatory effect of estradiol on ER-negative BC metastasis. Female ovariectomized mice were randomized into estradiol and control groups with 16 mice per group, and estradiol pellets were implanted subcutaneously in the estradiol group. Results demonstrated that estradiol accelerated BC metastasis as indicated by bioluminescent imaging. In addition, estradiol enhanced metastatic tumor colony formation and increased the size of tumor nodules in the lungs, which were due, in part, to the increase in proliferative cells in the metastatic tumors. In vitro, estradiol increased the motility and invasion of 4T1 cells, and the stimulatory effect on cell motility was not blocked by ICI 182, 780, confirming that ER was not involved in the process. 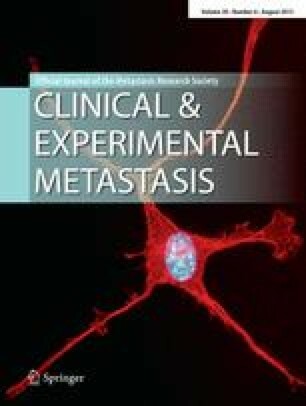 Results from the present study suggest that estradiol plays a role in ER-negative BC metastasis in whole animals. This study was supported by the National Cancer Institute [CA77355 to W.G.H. ]; the National Institute on Aging, the National Institute for Complementary and Alternative Medicine and the Office of Dietary Supplements, the Women’s Health Initiative [P01 AG024387 to W.G.H. and Y.H.J. ]; and the National Institute for Complementary and Alternative Medicine, the Office of Dietary Supplements and the National Cancer Institute [P50AT006268 to W.G.H.]. Its contents are solely the responsibility of the authors and do not necessarily represent the official views of the NICAM, ODS, NCI or the National Institutes of Health.